(WEHT) - In March 2017, President Trump, signed into law the designation of celebrating every March 29 as National Vietnam War Veterans Day. The U.S. Vietnam War Commemoration honors all United States veterans who served on active duty in the Armed Forces from November 1, 1955, to May 15, 1975. The Department of Veterans Affairs estimates that there are 6.4 million living Vietnam veterans and 9 million families of those who served during 1955 - 1975. This national commemoration was authorized by Congress, established under the Secretary of Defense, and launched by the President to thank and honor our Nation’s Vietnam veterans and their families for their service and sacrifice. To thank and honor Vietnam veterans and their families for their service and sacrifice on behalf of the Nation. By Presidential Proclamation, The Vietnam War Commemoration will continue through Veterans Day, November 11, 2025. A special thanks to all who served in our Armed Forces during this war. Wonder why it ends in 2025? Most reading this are wondering if they are supposed to be at work today. I think they should have a Memorial week, a day isn't enough. I don't know... some kind of Law?? I believe this covers everyone who served, no matter if they were in the Vietnam Theater or not... just in uniform. Everyone contributed. A very special thank you to any and all who served! 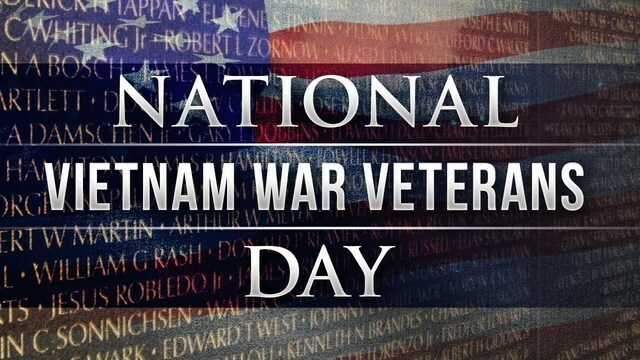 I know this may piss off some of my fellow Vietnam vet brothers, but I DO NOT desire a special day for being a Vietnam vet. I spent 11 months in a helo squadron there. I do not usually even say that much, and belong to no special organizations or forums just for Vietnam vets. Not shamed I was there.....except for having a government full of chicken **** politicians that never let us fight a war to win and for getting thousands of good young men killed and maimed for nothing. I use to wear a Vietnam vet hat till in Walmart I had a lady say..." So you want a dollar for being a "baby killer"? Either quit wearing it or forget what I learned about hitting a ...... even a stupid bitc_ is technically a woman. All I ever wanted and still want is to be respected and treated like a vet of any other war....nothing more. No special day, no special town monument, no trying to make up for anyone or anything done to me 27 years ago. You should get it anyhow Mike. As for the stupid human imposter at Walmart, take her out, it's your right. I got your back on this one if that's worth the cyber space it took to write this. People like that need to be educated and preferably sterilized so they don't propogate. We got enough freebie entitled tree huggers. It was a lousy war in a lousy place for lousy reasons; that's the good news. The bad news is that the politicians would not let us win and would not let us leave, so 58,000+ GI's died for nothing. I shake hands with and say "Welcome home, brother" to anyone who served in the U.S. military during that time, whether they were in-country or not. Everybody who joins the U.S. military takes the same oath and signs an undated check for whatever amount is necessary; what happens after that is mostly a roll of the dice. Last edited by Linthead; 04-02-2019 at 07:49 PM. I'll hold a door open for anyone behind or in front of me... even gangbanger-looking guys, but I never had one go off on me for holding the door open. Most thank me. If you feel better for blowing off steam, Mike, it's okay. I wasn't happy with how the war was run... and most people I know weren't either, but that's how it was... and still is at times, especially under the poseur POTUS we had before #45... good caliber... and saving us from a second civil war, so far. You wouldn't have liked Hillary, for sure.